Special Containment Procedures: Three samples of contaminated precipitation are to be maintained within a storage locker in the Infectious Wing of Research Site-██. 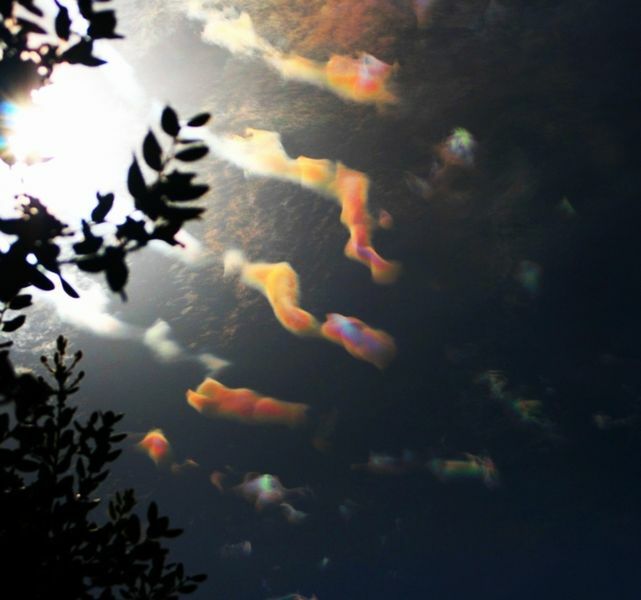 Reports of "cloud iridescence" are to be tracked until the likely area of precipitation can be identified and evacuated. Cover stories involving tornado activity are to be prepared and distributed afterwards, with area cleanup to consist of evaporation of contaminated water via heat lamp. Objects and subjects affected by SCP-858 are to be detained and destroyed on-site, incinerated, and their remains allowed to escape Earth orbit. Description: SCP-858 is a migrating noctilucent cloud which affects cirrus cloud formations beneath it. Presence of SCP-858 can be easily identified by the iridescent refraction within the cirrus formations, which, once affected, descend until precipitation ensues. Contact with precipitation from affected clouds immediately and permanently alters solid matter on contact. While apparently nonreactive with gasses and liquids, solid state reactions cause the molecular bonds of affected items to act as a vector, conducting the effect until the entirety of affected objects or organisms is repelled by, rather than attracted by, gravitational force. Porous materials act as a secondary vector, as affected water trapped in the substance in no way loses its effectiveness1. Barring sufficiently sturdy objects secured to sufficiently massive objects embedded or otherwise secured to Earth's surface, this results in the affected object accelerating away from the Earth's surface at 9.8m/s2. Upon contact with SCP-858 itself at roughly 80km above sea level, affected objects vanish. Encounter Summary 858-A: First encounter with SCP-858 was a meteorological survey aircraft passing through an affected cloud formation. When the aircraft was affected by SCP-858, the pilot, Captain █. Finch, was able to invert the aircraft and maintain flight for several hours; when the plane proved unable to land, Captain Finch instructed the crew to bail out. He then continued to fly the affected aircraft until it ran out of fuel, at which time he abandoned the craft and it entered free-fall- away from the Earth's surface. Captain Finch contracted hypothermia and frostbite due to the severe altitude at which he bailed out, but he has since made a full recovery. The plane's lateral velocity was sufficient to carry it past the boundaries of SCP-858. Later reports indicated forced emergency maneuvers on the part of a Russian satellite in the trajectory of the plane's debris. No other objects have been detected passing the Kármán line2. Finch's descriptions of the oddly colored cloud formations and their location led researchers to what remained of a small farming community outside of Xenia, Ohio. After Finch later forwarded his airline's incident report- in which the instruments showed the plane leaving Earth's atmosphere before failing completely- to a Foundation agent, an investigative team was dispatched to the location. The vehicle in which the team of six arrived was lost upon contact with damp road surfaces, but after leaping free of the vehicle, losses among initial responders were prevented, as the mass of responder hazmat suits were insufficient to overcome their occupant's weight. Investigation revealed all previously standing structures were devastated and, along with all residents outside of cellar shelters with strong foundations, unaccounted for. Most survivors were initially unwilling to leave their cellars when responders arrived, though a family of three was lost when their footwear was saturated while crossing their lawn to greet the response team. Reports from remaining survivors aided in isolating standing water as the source of the anomalous effect, as eyewitness reports stated that survivors emerging from their basements were seen rapidly ascending into the sky, later ascertained to have been due to assuming the danger had passed once there was nothing left to ascend- rainfall was continued. Even after precipitation ceased, other vehicles arriving after the fact continued to be affected- though the tires themselves were insufficient to displace the chassis, water sprayed onto the undercarriage by centripetal force compromised the vehicles in their entirety. Those persons able to exit their vehicles were inevitably suffered the same fate- regardless of whether they survived impact or not- as without the protection the responder's hazmat suits offered, they were affected by, and lost to, SCP-858 on contact with still-wet ground surfaces. Remaining survivors were extracted following natural evaporation of the anomalous precipitate, and were treated with amnestics before being released to their surviving relatives. Addendum: Proposals to investigate SCP-858 itself have been stymied by the extreme expense of reaching the 80km altitude of the cloud; however, plans for altering the maneuvering thrusters of a geostationary satellite- soon to be launched by Foundation front company, ██████████ Corporation- to compensate from gravitational drift away from the planet, rather than towards it, is under consideration, pending calculation of the launch date and location in concert with the position of SCP-858. 1. Saturation of footwear via droplets contaminating lawn surfaces has been confirmed sufficient to affect the wearer; see Encounter Summary 858-A for an example. 2. The Kármán line is generally used to define the point at 100km from Earth at which outer space is considered to begin.